OVERLAND PARK, Kansas – Weaver, an industry leader in high-performance optics and mounting systems for more than 80 years, continues its quest to revitalize the Grand Slam series and rewrite optics history by introducing the new Grand Slam Riflescope with MultiStop Turret. The revolutionary MultiStop Turret system lets shooters build their own custom ballistic turret for a fast, precise hold on distant targets, and then reconfigure it for different loads and firearms. Designed to ensure accuracy and eliminate hold-over, color-coded bands on the turret can be adjusted to perfectly match any load. Simply turn the turret to the band color that corresponds to the correct distance, hold dead-on and watch your target tumble. To further engender ease of use and downrange proficiency, the custom aluminum lens cap provides a heads-up range/color reference card for fast turret stop selection. Shooters can visit www.weaveroptics.com/BallisticCalculator to set up their scope and print off a custom dope sheet to place in the lens cap for handy reference. 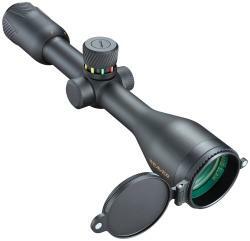 Available in 4-16x 44mm and 5-20x 50mm options, the Grand Slam Riflescope with MultiStop Turret also features precision-ground, fully multi-coated lenses for clear edge-to-edge viewing. Rugged one-piece, 1-inch tube construction is standard, as is Argon purging to eliminate internal fogging. The scope also offers side-focus parallax adjustment for long-range precision; a cross-balanced spring system for repeatable high-precision windage and elevation adjustment; and an improved erector spring design that maximizes force and uniformity throughout travel. Weaver, a Vista Outdoor, Inc. brand, has more than 80 years of experience creating the world’s most reliable optics and mounting systems. For more information, visit www.weaveroptics.com.